On Day 3 of our Iceland adventure, we fell victim to jet lag. We woke up late (at the time we were supposed to be downstairs for our shuttle pickup) and got ready in a record 5 minutes. The travel Gods seemed to be on our side. Our shuttle was running behind schedule and we found it down the street at the next hotel. One word to the wise. If your bus stops for a restroom break, take advantage! Many of these bus tours are a whole day and there may be limited access to a restroom. There is no bathroom on the bus. On the pit stop, I also took advantage by buying a sandwich to put in my backpack. Pack snacks, energy bars, and food and water if you can. Sometimes there will be no option for a food break or rest break during these tours. Our first stop on the way to our glacier hike was the Eyjafjallajokull volcano. This volcano erupted in 2010. We caught a glimpse of the farm that withstood the eruption. We were also able to touch the ash remnants of Eyjafjallajokull. Once we got to the Solheimajokull glacier, we put on our safety gear and got a quick lesson on how to walk on a glacier and follow your crew. We were given crampons and an ice axe for better grip on the glacier. We had our snowboots on (Timberland and Sorel). I recommend a good hiking boot or snowboot when you go on the glacier hike. If you only have sneakers or other improper footwear, the tour company is well equipped to lend you a pair of hiking boots. While hiking Solheimajokull is for "beginners" I would say it is a little intense and can be difficult at times. Walking in bulky winter gear up a hill with the sun in your eyes can be challenging. Definitely get in shape before doing this. With that said, the hike can really be done by a beginner but it is not a cake walk. The glacier hike tour was very educational. We learned about ice tunnels, the effects of global warming, the history of the glacier, and how to maneuver on a glacier. Did I mention on top of it all, the glacier is beautiful? It's massive and the ice crystals have the most amazing colors. Learning how glaciers change and evolve. 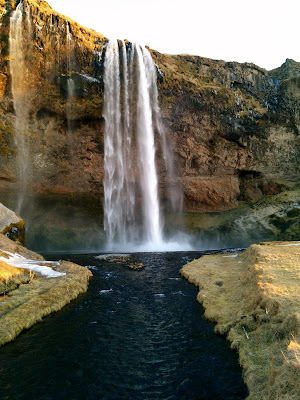 After the glacier hike, our bus stopped at two waterfalls: Skogafoss and Seljalandfoss. Skogafoss was my favorite waterfall of all the waterfalls we saw on our trip. You could walk up close to it and it was massive. The water gave way to rainbows and to the side on the hill you could see some Icelandic horses. Seljalandfoss was a smaller waterfall that you could walk behind to catch a view of the running water. At the time we went it was winter and the water on the ground had turned to ice. We had to hold on to the chained path to avoid slipping. I was looking from a different vantage point and slipped by the bridge. Be careful out there.